Editor’s Note: Relevant financial details in blue, folks. Wow, what a Top 8 to top off the season with. Two Hall of Fame members and a few likely future inductees make for a bracket where anything can happen as a diverse set of new decks make waves and vie for the first place trophy in Australia. Heading into this Pro Tour many observers seemed convinced that the metagame was likely to revolve around Bant Company. Indeed this is what happened, but not in the way folks expected. With everyone gunning for the same deck, the consensus that coalesced across multiple new decks was to go big or go home.As a result we got an incredibly diverse field and a Top 8 full to the brim with eight distinct decks and a plethora of innovative brewing technology. The Top 8 competition may be the best of all time, with three Hall of Fame members, a former Player of the Year, and the current World Champion. Based on this, it’s worth taking a look at Kozilek’s Return near $10, and Liliana looks like a solid sell at current prices. Owen and Yuta trade blows, earning a game each, before Owen takes an epic game three after casting Emrakul, the Promised End four times in the same game, and top decks a crucial Elder Deep-Fiend to dodge yet another bullet this weekend. In the final game some familiar back and forth ends in sadness for Takahashi as Emrakul ends up finishing yet another critical game this weekend. LSV is up two games off camera, and seems likely to dash Reid’s hope of a Pro Tour win. Reid rallies in the third game and puts LSV on the ropes with an Emrakul, but LSV manages to beat the biggest threat of the weekend yet again to move ahead into the semi-finals and a chance at a big addition to his resume. The players trade two games a piece, and the players move to a deciding game. Great to see Hangarback Walker making a late mark on the format to punctuate the dominance the card held last fall. After a grindy Game 5, Blohon cleans up the board after some timely discard spells, and is able to drive home the necessary damage to take the match. LSV is in fine form this evening, and takes Game 1 after a sick Avacyn flip to clear Owen’s board and set up an alpha strike. In Game 2, LSV presents significant early pressure without the help of Collected Company, but Owen is able to go from Elder Deep-Fiend to stabilize on into Emrakul to wreck Luis’ board and take the game. Game 3 is our first sideboarded game and LSV again presents early pressure and has the Dromoka’s Command needed to drive it home to take a 2-1 lead. In Game 4 a timely back to back casting of Kozilek’s Return via Emrakul coming into play, absolutely wrecks LSV’s attack force, and Owen is able to fade a couple of draws from his opponent to force Game 5. In the final game, LSV stumbles on land for a turn too long, allowing Owen to dictate the tempo of the early game and drop him to just one life in short order. Luis managed to stabilize and started looking for a window to cast Subjugator Angel, tap Owen’s team and swing for a win. Instead Owen is able to force blocks with Ishkanah and the threat of Kozilek’s Return and a timely Elder Deep-Fiend puts Owen into the finals. 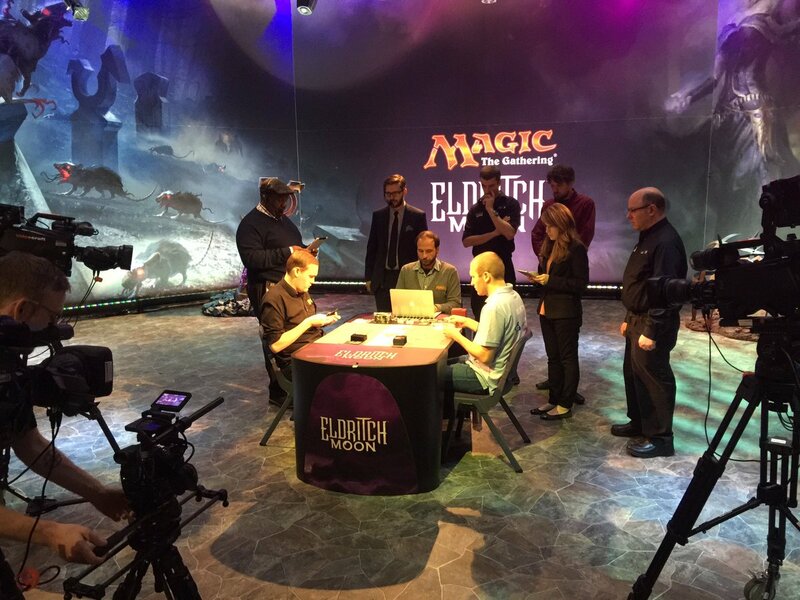 Hats off to LSV for making his third Pro Tour Top 8 in a row, an accomplishment only matched once in Magic history. 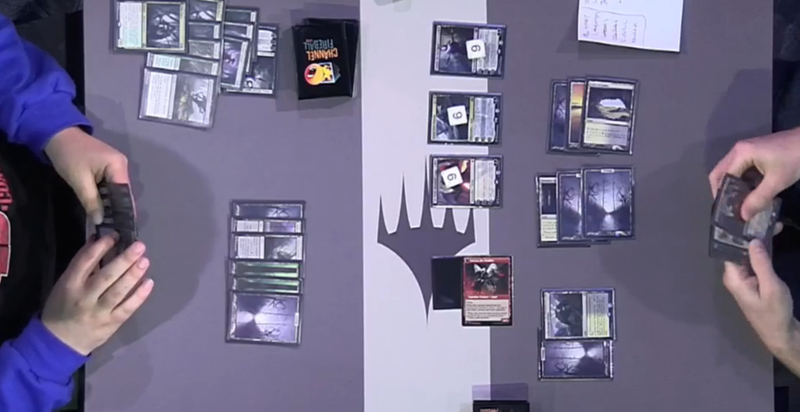 LSV in the booth as we watch the Liliana, the Last Hope show, with a total of seven copies between these two decks. Luis notes that he had to face Emrakul in nine of ten rounds of Standard play. Card is everywhere. In Game 1, Lukas is able to get to the Liliana zombie ultimate first, and a few turns later he claims first blood. In Game 2, Blohon ends up with three powerful planeswalkers in play and drives home Avacyn to go up two games. In Game 3, Lukas easily handles the early threat from Pardee, and then gets Kalitas, some zombie minions and an Avacyn onto an empty board to easily dispatch his opponent and move to a final against Owen Turtenwald. Owen Turtenwald comes into this finals match an absolute juggernaut, having won Player of the Year, US National Champion and joining the Hall of Fame all in the same weekend. Now he has the chance to be the first ever Hall of Famer to win the Pro Tour where they joined the Hall. Lukas however, has been playing very tightly all weekend and seems reasonably well positioned here if he can get rid of Emrakul and his Eldrazi brethren with early discard spells or timely kill spells. Owen has won many games on the back of Kozilek’s Return flashing back from Elder Deep-Fiend or Emrakul, the Promised Hope, a game plan I’m sure he’ll be looking to lock in for the win. Financially, we’ve seen movement on Kozilek’s Return over the last few hours up to $13 (from spring lows around $5), and Liliana and Emrakul are both holding solid price points from earlier spikes. Game 1 sees Lukas get down an early Liliana that ticks up to her emblem unchecked as Owen gets stuck holding a grip of lands and only enough threats to swallow a few kill spells from Lukas. With Avacyn and Linvala also in play from Blohon, Owen goes down without getting a chance to engage in Eldrazi emerge shenanigans. Game 2 sees the scene set in similar fashion with early plays from Owen, including an Emrakul, being handled efficiently by kill spells and sweepers, only to have Liliana enter play and march up toward the inevitable zombie army. Backing Liliana are once again Avacyn and Kalitas, and once the emblem kicks in, things spiral toward a 2-0 lead for Lukas, with Lukas at thirty-six life. An Emrakul almost gets Owen back in the game, but he ends up needing two strong draw steps in a row to stave off defeat and doesn’t find what he needs. So far the dark walker looks set to hold her price for the time being, though the BW archetype didn’t do particularly well across the full tournament record. Game 3 starts no better for Owen, as he misses his third land drop, and Infinite Obliteration hits not one, but two copies of Emrakul in Owen’s hand, along with the third one in the deck. Owen misses the land once again, and Gideon arrives to apply Pro Tour winning pressure. 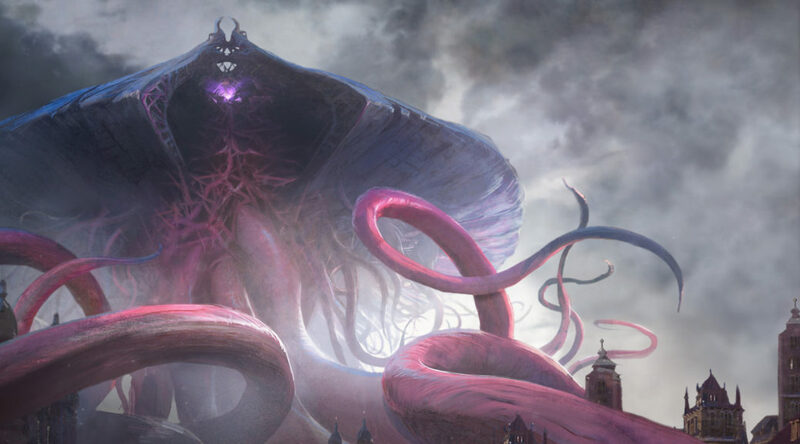 Lukas Blohon takes down Pro Tour Eldritch Moon and justifies the Liliana, the Last Hope hype, and brings the set narrative to life in fantastic fashion. Emrakul, despite finishing 2nd, has posted up at the $30 plateau, providing a solid shot at $10/copy in gains after fees for those that got in closer to $12. See you guys next time in Kaladesh! Kozilek’s Return got a lot better with EMN and the 10 Emerge Eldrazi that cost 7 or more. Two of them have flash, Elder Deep-Fiend and Drownyard Behemoth. Wretch Gryff works too. I was hoping jace wouldn’t be there. I’d like to get in on some cheap. Oh well. I think you’ll still get the chance. He should drop again when the Standard players using him finally let go in Sep.
Lots of talk about the counter to Emrakul: Summary Dismissal. Scott Johns top 8d three in a row as well as Finkel.